They are full color business cards that have been laminated with a material that has a silk texture feel to it. Silk laminated coating is a fairly new technology advancement in the field of design and print. It was developed to increase the appeal of printed material, as well as the durability. Silk business cards are much more attractive than the generic gloss or matte finish applied to most printed pieces. Silk laminate produces a very rich thick effect when applied to a good business card stock. They tend to feel very silky and smooth to the touch. 3.5x2" Silk business cards for florist shop are much more likely to impress prospective customers than traditional plain matte-finish cards. Silk business cards give off a distinguished elegance that will convince even the most skeptical consumer that your business is legitmate and top-notch. The 3.5x2" Silk business cards for catering service will seperate you from the other boring business cards in circulation. Of course these cards aren't actually made of silk - and trust us, that's a good thing. If your business cards were actually laminated in silk, you could count on them crumbling into balls of pretty useless fabric in the palm of your hand. 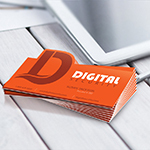 Our high end die-cut business cards are great way to make yourself stand out amongst the crowd. While these silk laminated business cards have the gorgeous appearance of real silk, they're actually just normal business cards, printed on sturdy 16pt cardstock, and then laminated in a very thin coating of brushed plastic. The 3.5x2" silk laminated business cards for boutiques It's the brushed plastic lamination that gives these "silk" laminated business cards their unique look and feel and much more than that. That same thin coat of plastic protects your card as well. So get it together and bring some easy sophistication to your image. 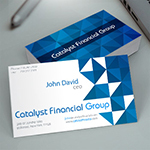 Silk laminated business cards are not just easy to design and order - they're also extremely affordable. 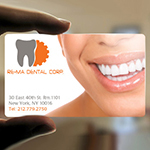 We offer plastic business card printing which can be made in full color on one or both sides. Silk laminated business cards are a great way to make your mark and can definitely give you an edge in a competitive marketplace. Printing Xpert has added silk lamination to our offerings because we think it is the perfect addition to our quality printing and design services. Adding silk lamination to one of our dynamic, custom designed business cards is the perfect finish that just adds to the message of high quality and professionalism that our customers want to project. The front is printed in the 4 color process as in 4/4 printing but the back remains blank with no color. 16pt cover stock is a silky lamination that gives unique touch and softness. Spot UV is just an exact spot where you like your printed Business Cards to have UV Glossy. Silk is known for its delicate and smooth texture. It's sophisticated, half matte, half shiny appearance, it's cool, natural feel against the skin and its luxurious appeal. This simple fabric does so much to add elegance and style to your business card. Silk laminated business cards bring all the class of a beautiful silk shirt or scarf right to the palm of your hand. Your name, your title, and your company name are all decked out on a smooth beautifully textured card that reflects light just like real silk. While these silk laminated business cards have the gorgeous appearance of real silk, they're actually just normal business cards, printed on sturdy 16pt cardstock, and then laminated in a very thin coating of brushed plastic. It's the brushed plastic lamination that gives these "silk" laminated business cards their unique look and feel - and much more than that. That same thin coat of plastic protects your card as well. Professionals of all kinds should carry their cards with them always. If that's the plan, you had better choose a business card that can stand up to some wear and tear. Well, that's what you'll get with silk laminated business cards. Their "silk" lamination renders them waterproof, so if you wind up in a storm with a bunch of your business cards in your pocket, you can be sure you can still give them out with confidence once things dry up. They are also resistant to bending and folding, so they'll keep their classy, brand new appearance even after they've been riding around in your wallet for a few weeks or months! But, then again they look so cool and you'll be so proud of your unique-looking card, we have a feeling you won't have any trouble giving them out quickly. From beauty salons to construction companies. These cards are strong, tear resistant, water resistant yet have a silky smooth texture. Most importantly, you can write on them! 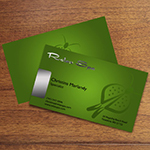 Silk business cards have a silky lamination placed over them after print. The coating has a silky feel that is unique and impressive. The laminate has a flat matte finish yet still holds it's clarity and sharpness. Silk lamination is a fairly new process that many have not yet heard of or seen. You must see and feel them to understand them. "My new silk business cards helped me to make a great impression at a very important business Event"
I love the feel of my new silk business cards from Printing Xpert. My clients are very impressed. The 16pt cover stock is a silky lamination that gives unique touch and softness. the subtle rounded edges on these cards will truly help you give a good impression and be remembered. Product: Silk Laminated Business card, 3.5" X 2""